A step stool is an excellent tool for toddlers, allowing them to explore a new exciting world from a different perspective! A customized stepstool will not only be a useful tool for your child as a toddler, but will provide a childhood keepsake that can be kept into adulthood and provide memories. The need for a quality step stool goes far beyond the obvious. First, we have the intended use of a step stool – giving your precious little ones a boost! A few extra inches of height allows them a degree of independence to brush their teeth and pick items from shelves without putting them in danger. A quality step stool can also be used as a seat for little ones, or as a table for snacks, writing and drawing. A quality step stool can even be used as a learning tool! 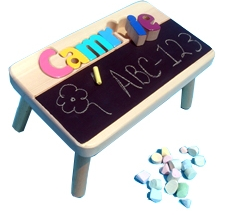 A step stool featuring your child’s name and a chalkboard helps them to memorize, spell and write their name. This gives your child a creative space to practice writing their name or draw the new things they see in the world around them. It is easily erasable and won’t leave you a mess to clean up. A standard wooden step stool can also be useful as a small desk for the smallest members of your family, giving them their own space to draw with crayons, markers and colored pencils to help them explore and learn colors. A step stool with wooden letters encourages learning by making spelling practice fun and helps with letter recognition.